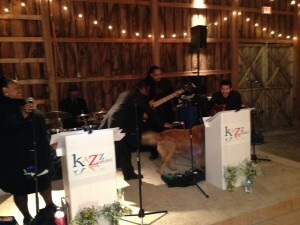 The Band had a visitor on stage – the bride and groom’s dog! On September 14, 2013, we played for the wedding of Danielle and Montana – a truly fun party at the Stone Tavern Farm in Roxbury, NY – about 3.5 hours outside of NYC. 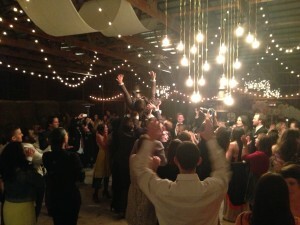 The venue is an amazing rustic barn situated on a farm pretty much in the middle of nowhere. The setting couldn’t have been more perfect! For the ceremony (outdoors in the freezing cold! ), our pianist, Andrea, played solo piano, including songs by Phil Collins, Iron Maiden, and Journey. For the reception, we had the 8 piece version of our band playing for what was truly a wild party that was TONS of fun – with food catered by Dinosaur BBQ! Some highlights as seen in the photos here – Danielle and Montana’s dog joined us on stage several times, Montana ended up crowd surfing while we were playing, and overall, we spent a good amount of time dancing with the crowd as well. Montana and Danielle requested two awesome new songs for us to learn – 25 or 6 to 4 by Chicago, and Reelin’ In the Years by Steely Dan. Both are officially regulars in our band’s repertoire now because we had so much fun with them, and the crowd loved them both so much!